Our live room is a cosy space, desinged to cater for our most common uses: recording overdubs and vocals, but a drum set and two other musicians can be fitted in comfortably. The sound of the space is tight, controlled and defined and it can be either slightly livened up of completely damped by using heavy curtains. We have a number of instruments, amplifiers and the like at artists’ disposal and our microphone collection ensures that your sound will be captured either truthfully or sweetened by the sound of vintage Neumann microphones, U48 or the stereo pair of CMV-563’s. 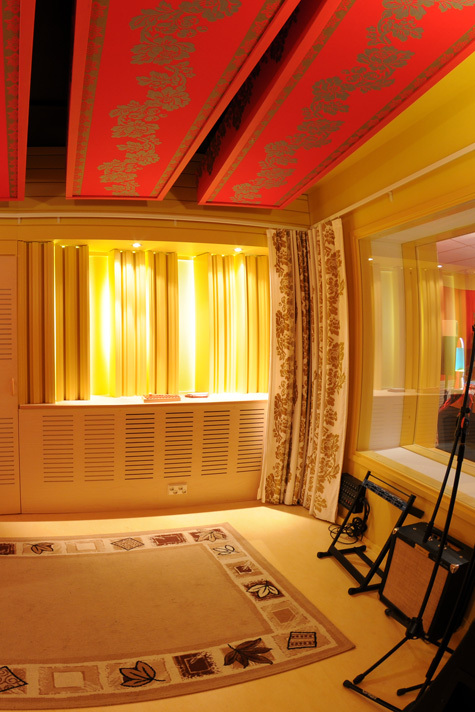 There is also a small ProTools setup in the live room, intended as an extra editing station during very busy times, but also as a setup for producers and self-recording artists to record last-minute additions to tracks without interrupting the mixing process, or simply a place to record vocals with an excellent microphone in a great-sounding room. The setup can also be taken off-site for location recording. Contact us for more details.